At the extreme eastern end of Nice, just below the Basse Corniche is Cap de Nice, a rocky cape that lies at the foot of Mont Boron. It's considered one of Nice's most desirable neighbourhoods as the western views over the Mediterranean towards Nice are inspiring in any season. A rocky footpath stretches all along the cape as far as Villefranche-sur-Mer, winding up, over and around the heavily indented coastline. 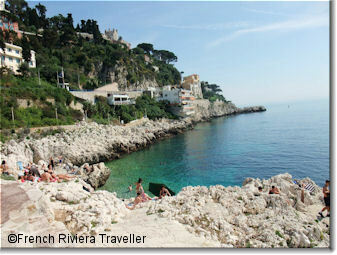 Along the way are tiny coves and flat rocks often dotted with locals working on their tan. The footpath is "managed" by Nice which is to say that there are discreet stairs and guardrails when needed. This stroll is a particular favorite of sun-starved locals in the dead of winter when the western sun glints off the white rocks creating a summery light. 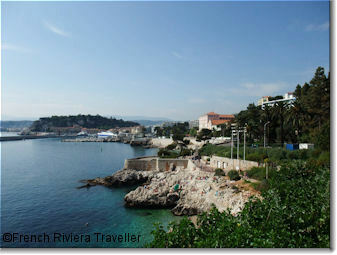 Nice's easternmost beach, Coco Beach, is also a part of the Cap de Nice although the beach is really a series of gravelly coves at the foot of the rocks. It's a favorite of teenagers who enjoy jumping off the rocks as well as anyone needing to cool off after a walk on the shadeless coastal path. There are a few showers on Coco Beach and wonderful views of the Baie des Anges. There are steps and ladders leading to the water's edge in some, but not all places. See more on Coco beach and surrounding beaches.